* These are not stapled pieces of paneling and plywood. Each Boat is made with solid wood bottoms using several boards in order to accentuate the differences in grains and the display of knots and natural beauty. Bottoms are usually constructed of hemlock, spruce, fir or pine. The sides are steamed and formed to fit the boat frame using 1/4th-inch lumber core with hardwood veneer cover. The foredeck is a solid piece of pine, hemlock or hardwood that has a routed edge and is lacquered to a high finish. Top trim on the sides is put on one piece at a time and built-up by lamination of individual, solid pieces of maple, birch, beech or other tight-grained hardwoods. Bottom trim on models shown is hemlock and is one solid piece --- no lamination. Back and shelves are pine, hemlock or similar softwood. Shelves are typically made of a single piece but at times two pieces may be joined to make one shelf. Metal flashing trim is copper and is secured using copper nails. Trim is used on the top and bottom of the bow and also on the vertical point of the bow. Oars are lathe-turned and then hand finished to creat the paddle portion. 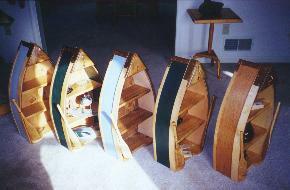 They are made from pine and are finely sanded and lacquered to a high finish. Oars are installed in place using a copper wire-wrap which is then integrated into the top side trim. Foredeck trim piece is hand fashioned from solid copper round stock. It is installed using copper nails. Tie-up bow ring is made from the same copper round stock as the foredeck trim. It is then brazed as a solid ring using a brass filler. These boats are extremely sturdy. All exterior joints are 100-percent sealed and no nails or fasteners are visible except on the backside where shelves are fastened. Each boat is painted with latex paint or is left natural and given a lacquer finish. The boats are mostly set on floors or shelves for display but each also has double saw-tooth hangers for wall mounting. These are securely mounted using screws and are recessed into the back so as to allow for a flush mount against the wall. While the models shown in this site represent the standard line of boats, orders placed in advance can be modified to have other paint or stain color variations. Foredeck --- medium dark to dark.